Our friendly frackers have forgotten about the right of citizens to petition for a redress of grievances. 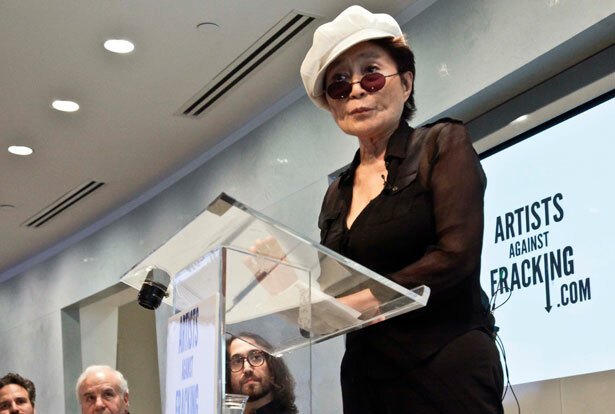 Fox News featured the story: The Independent Oil & Gas Association, our friendly frackers, filed a formal complaint against Yoko Ono and her organization, Artists Against Fracking, claiming the group is violating New York state law by failing to register as lobbyists. You might view the complaint, and the news coverage, as a measure of the success of the campaign launched by Yoko and her son Sean Lennon, who have been joined by more than 200 well-known people, including Salman Rushdie, Jeff Koons, Alec Baldwin, Martha Stewart, David Geffen, Anne Hathaway, Jimmy Fallon and Lady Gaga—with her 34 million Twitter followers. In Albany in January, Yoko and Sean delivered an anti-fracking petition to Governor Cuomo with more than 50,000 signatures. Also in January, she and Sean and Susan Sarandon led a bus tour of Dimock, Pennsylvania, where the local water supply has been contaminated by fracking. And she recently released a video called “Don’t Frack My Mother,” featuring celebrities such as Joseph Gordon-Levitt, Maggie Gyllenhaal and Susan Sarandon. The frackers seem to have forgotten that “the right of the people” to “petition their government for a redress of grievances” is protected by the First Amendment to the Constitution. The complaint, filed at the end of March with the state's Joint Commission on Public Ethics, argues that lobbying groups that spend more than $5,000 are required to register and report their finances, and that Artists Against Fracking is such a group. A spokesman for Artists Against Fracking told the AP that the group and its individual members don't have to register as lobbyists. "As private citizens, Yoko and Sean are not required to register as lobbyists when they use their own money to express an opinion,” David Fenton said. “There's also no lobbying requirement when you are engaged in a public comment period by a state agency." After the public comment period, Fenton said, “Artists Against Fracking will consider registering. Up to now, there has been no violation because they are entitled to do this as private citizens with their own money." How to catch corporations for lying about political transparency? Read Lee Fang's analysis.